SiriusXM and Live Nation will present the Hair Nation Tour hosted by Eddie Trunk, whose Trunk Nation show airs on Hair Nation (Ch. 39) as well as on VOLUME (Ch. 106), featuring JACK RUSSELL'S GREAT WHITE, BULLETBOYS and ENUFF Z'NUFF. The 21-city U.S. tour will kick off September 12 at San Diego’s House of Blues. The tour offers listeners and music fans across the U.S. chance to see the bands who have been giving us decades of larger-than-life rock music. 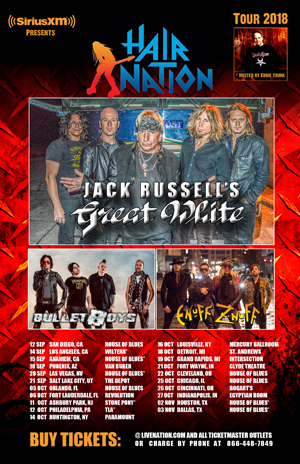 Tickets for the Hair Nation Tour with JACK RUSSELL'S GREAT WHITE, BULLETBOYS and ENUFF Z'NUFF go on sale June 8 at 10 am local time.